The Ford Mustang is known for being powerful, fun to drive and fairly affordable, but if you go to any large all-Mustang car show, nothing will jump out at you as much as the rainbow of colors. Even though black and silver have become the most popular options for new cars in the USA, the Ford Mustang continues to be offered in bold, bright colors that allow the original pony car to stand out in any crowd. In fact, the colors of the Ford Mustang are so critical that entire websites and clubs are dedicated to specific color groups, such as the Yellow Mustang Registry. With this in mind, while the leaked color palate for the 2016 Ford Mustang might not seem like a big deal, it is actually one of the biggest factors for prospective Mustang buyers after they have picked their trimline and drivetrain options. 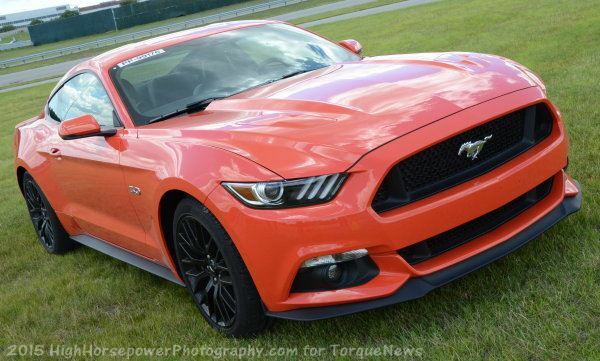 Based on the leaked information from the crew at Mustang6g, the 2016 Ford Mustang will be offered in ten exterior colors, just like the 2015 models. Also like the 2015 Mustang, the 2016 Mustang will be offered in Competition Orange, Triple Yellow Tri-coat, Guard, Deep Impact Blue, Magnetic, Race Red, Ruby Red Metallic Tinted Clearcoat, Ingot Silver and Oxford White. The two differences appear to be that the 2015 Mustang Black is being replaced by Shadow Black in 2016 and that the two colors of the 50 Year Edition 2015 Mustang – Wimbledon White and Kona Blue – are not going to be offered for 2016. However, neither of those colors were available for the full 2015 lineup, so buyers of the 2016 Mustang aren’t really losing any options. Kona Blue is still available for 2016 on the Focus, Fiesta and C-Max, but not the Mustang. The leaked dealership brochure for the 2016 Ford Mustang lists colors for a variety of vehicles, including specific mentions of the Fiesta ST and Focus ST. However, there is no mention of the Mustang Shelby GT350 models, which makes sense considering that they are likely going to be late availability models for 2016. I would expect that the new Shelby Mustang will get at least one or two of its own colors, and with the first Shelby Mustangs back in the 1960s coming in white and blue, we could see Kona Blue and Wimbledon White returned as a Shelby-only color for 2016.
that appears to be one of the grosses versions of orange I have ever seen. I can only hope I am wrong, but I do not think I am. I agree, but I think it's more camera exposure settings than actual color. I had a 2013 mustang gt. turned 70 and traded for a 2014 mustang v6 convt! miss the GT. but the v6 is groing on me!! How do I get a job naming paint colors? Guard? Magnetic? I don't get it.